The Royal Academy Summer Show offers nothing if not variety. If you hate Hockney landscapes, you might find a Gillian Ayres or a Fiona Rae more your cup of tea. These days you can even experience a mild sense of outrage at being confronted with a cack-handed Tracey Emin monoprint of a lady’s fundament. But ten years back, in the 2002 show, it was a black bin bag that really pierced my complacent bubble. There was no labelling on the floor, or by the adjacent wall, to say what it was or who did it. 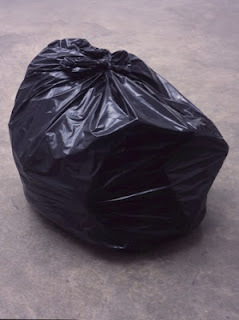 Just a black plastic bin bag, thrown on the floor. It wasn’t cordoned off in any way - unusual, surely? If such a fragile object was intended to be treated reverentially as a piece of creative work, wouldn’t it have been marked out in some way as… well, as art? My friend and I stared at it, genuinely puzzled. We didn’t know what we were looking at. We momentarily felt the paranoia and awkwardness of a gallery space, which, post-Duchamp, elevates everyday objects like bin bags into art – but which consequently blurs the boundaries in the opposite direction. Sometimes you get it wrong and end up being reverential to things that aren’t even art. A few years ago I accidentally wandered into a room in Tate Britain where a rehang was beginning. There was a workman’s bench, a bit of sawdust, not much else. It stopped me in my tracks; was I being an idiot, or was this art? It wasn’t, of course, and I felt like a wally for even entertaining the thought. That’s what conceptual artists from Dada to Minimalism have done to our brains though. There’s an extremely fine line between the Emperor and his New Clothes. This was 2002, remember. 9/11 had literally only just happened and everyone in London was on high alert for unattended bags and suspicious parcels. Paranoia was in the air, and here was an item which had none of the usual signifiers (pedestals, labels, cordons) of gallery conventions. My friend bravely reached forward and touched the object with her index finger. As her digit made contact she jumped back with a yelp, shocked. I did; it was made of metal. I experienced the weirdest paradigm shift I’ve ever experienced in a gallery. What I’d assumed to be a soft plastic, literally disposable object was solid, heavy, unyielding metal. It was a truly perfect recreation, not only of the shape of a bin bag, but also of every nuance of it’s surface texture. We’d been fully tricked. We were looking at a mind-bending piece of sculptural mimesis. We stood aside and watched, as at least three sets of gallery-goers came forward and had almost identical conversations to ours. Everyone was wrong-footed by it, and every single person began worrying straight off that it might be a bomb. If the artist (who I have since discovered was Gavin Turk) had labelled this piece, it would have been useless. He understood that viewers had to find out for themselves if it was meant to be there – and only by touching it would they learn, in the most delightful, delicious way, that it was a piece of trickery to our senses. The icing on the cake seemed to be that it wasn’t just a clever piece of metal masquerading as plastic, some mere virtuoso showing off. It seemed to act as a paranoia thermometer, too, taking the temperature of London’s mood circa 2002. It was a mirror to help us see how jumpy and nervy we all were that year around things, especially bags. It took a bin bag to reveal our urban angst, and our half-buried terror of terror.